Introducing my gut friendly marshmallows!!! So why are they gut friendly? Because they’re free from corn syrup and processed sugar + they’re packed with gut lovin gelatin. 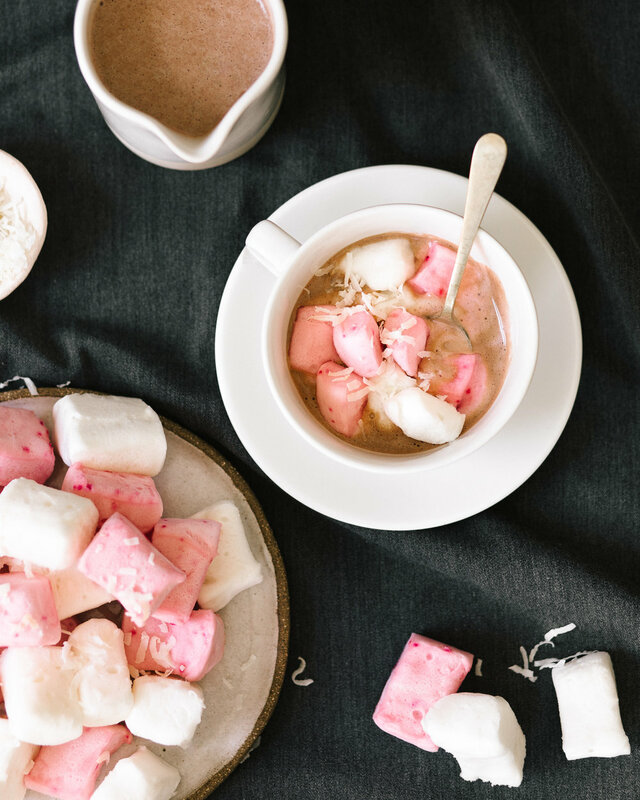 These marshmallows may seem a little tricky at first, but trust me, once you make them, the second time will be an absolute breeze. I have made them 6x now (you know I just had to check they work!) and each time i feel like it get’s easier/ faster to make them. 2 Tbsp erythritol or natvia (which is a mix of stevia and erythritol) - please note you can use honey to taste, however it will change the flavour and the colour so it won’t be white. Liquid stevia does NOT work in this recipe. Add the water into Thermomix bowl, and carefully sprinkle the gelatin powder in making sure it sits on the surface of the water (not on the blades). Let it sit for a couple of minutes to absorb the water, then add the remaining ingredients (except natural colours), and insert the butterfly whisk. Place steamer basket onto lid instead of MC, so steam can escape. Now mix for 10-12 mins/speed 4. (Keep butterfly whisk attached, and steamer basket on lid instead of MC.) You’ll know when it’s ready because the mixture should be thick and glossy and look a little like beaten egg whites but still airy. If it doesn’t resemble this, I would recommend you keep mixing for another few minutes, or until it reaches the right consistency. If it reaches that consistency before the 12 minutes then stop mixing and move onto the next step. Place 1/2 a cup of the water into a medium bowl (or in the bowl of a mixer), and sprinkle the gelatin over the water. Set aside to allow the gelatin to absorb the water. Once both marshmallows are set, use kitchen scissors to chop them into squares. Eat ‘as is’ or on top of my Bulletproof Cinnamon Hot Chocolate. Stay tuned for my Rocky Road recipe, it’s coming soon.